Who can live without burgers? Not this girl. Okay, I love sausage and burgers. I just hate that they’re full of stuff that’s not very good for you like cholesterol and lots of fat and that animals have to die to make them. This is a recipe I’m still working on but it’s more than good enough to share. To make my black-eyed pea burgers (taste better than they sound, promise) you’ll need to combine the following in a large bowl. Once everything is in the bowl except for the garlic salt and hot sauce, start mooshing. This might be a great job for any children in the house, it’s fun and can be done with your hands. 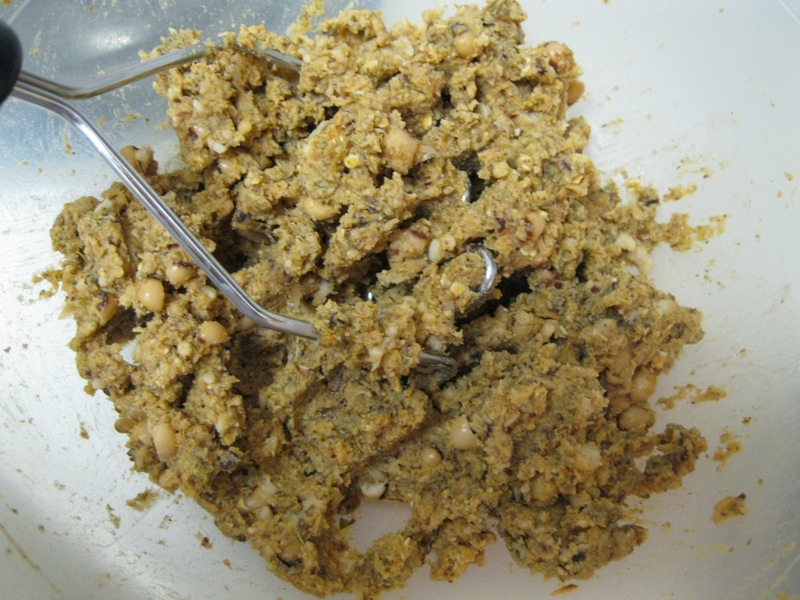 Add the liquid from the canned peas until the mixture is doughy and somewhat dry but not crumbly. You shouldn’t have to add very much. When it starts to look uniform (as above ) take a taste. Don’t worry, there’s no risk of E. coli or Salmonella, it’s not meat! Start adding hot sauce and garlic salt and continue mooshing until it tastes right to you. 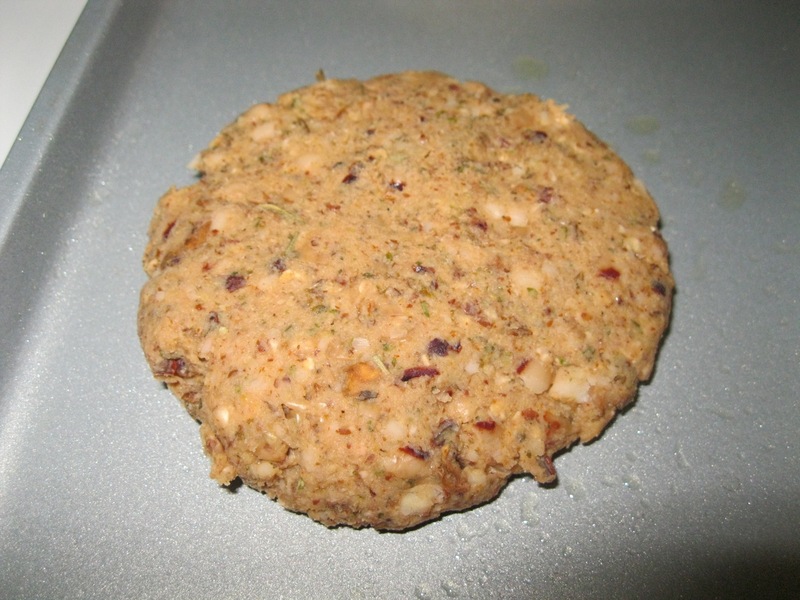 When you like the flavor and texture, pick up a good handful of the mixture and form it into a patty shape. 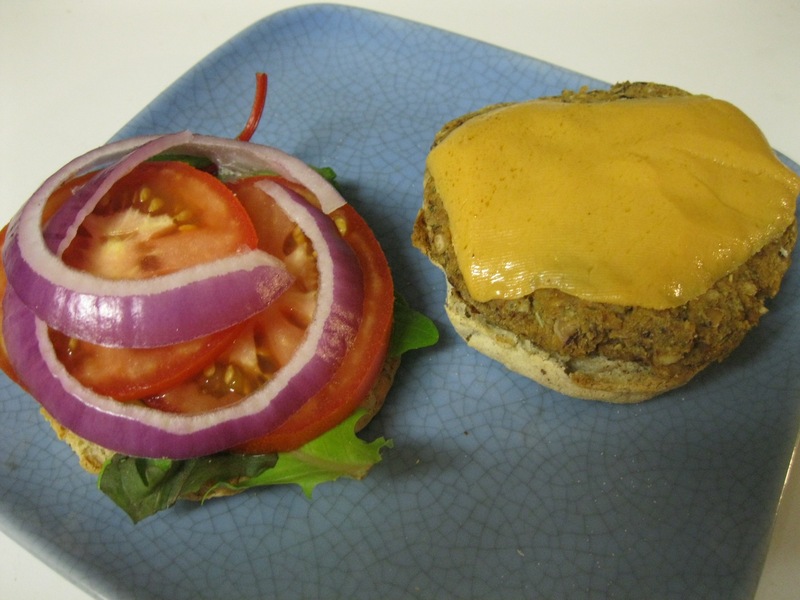 This recipe should make 3 generous patties for a regular sized bun. They won’t shrink much during cooking because there’s no lard to dribble off into the pan leaving you with an emaciated burger. I prefer to bake mine at 350F/175C for 25 minutes or until crispy outside and still mooshy inside but you can pan fry them in olive oil to the same effect if you’re feeling decadent. I like that these are fat and cholesterol free but mostly because my Dad and sister have high cholesterol and I’m sure they’re not alone. I toasted my buns and melted my cheese for the last 2-3 minutes of the bake. This cheese is Daiya. They sell 5 lb. blocks and shreds. Yeah, I admit it. I have a 5 lb. block of non-dairy cheese in my fridge. I’m not ashamed of my 5 lb. block of non-dairy cheese. Daiya is the best cheese substitute I’ve found for cooking. It’s great in quesadillas, on ‘burgers’, for mac and cheese, pretty much anything you can think of… okay, that’s my Daiya plug. There are other non-dairy cheese that I like but that’s another blog post. Did I mention that you can refrigerate these burgers for 2-3 days until your ready to cook them up or freeze them for up to 3 weeks? Yeah. You can. Also, the buns came from the Zen Cat Bakery (http://zencatbakery.com/) a gluten-free and vegan bakery. They are also awesome and make gluten-free vegan brownies that can defeat my PMS with a single bite! This didn’t last long. If you try it, would you let me know how it goes? Here’s to your healthy burger!!! this is Christie, signing off.. to eat another guilt free burger. This is so great! My least favorite thing about meat burgers is the risk of poisoning yourself with nasty bacteria. 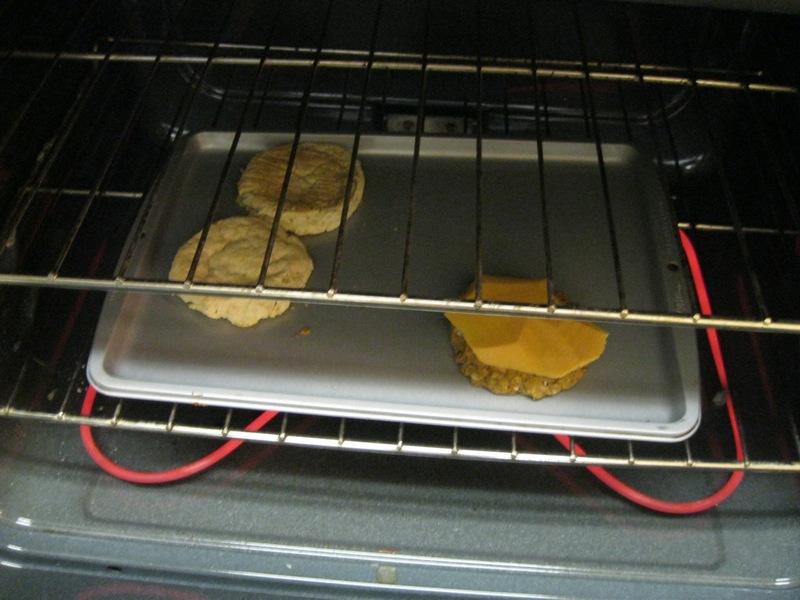 No worries about that here, and looks much more appetizing than a pre-made, store-bought veggie burger. Yay! I’m glad you like. It’s really easy. These actually sound pretty delicious and I’d love to try them…but you’re trying to murder me with the mushrooms!! Do you know of any good substitutes for mushrooms? I don’t cook with them but I hear they give off a lot of moisture during cooking. I’m wondering if leaving them out would produce a dry and crumbly burger…? Thoughts? I find that chopping them finely eliminates the moisture problem you’re talking about. Mushrooms are definitely porous and moist and a lot of liquid ends up on my cutting board. Also, the 25 minute bake time is a lot longer than you might think: the ‘shrooms help keep things moist. If you want to fry them, you might try sauteing the mushrooms first to cook out the moisture. 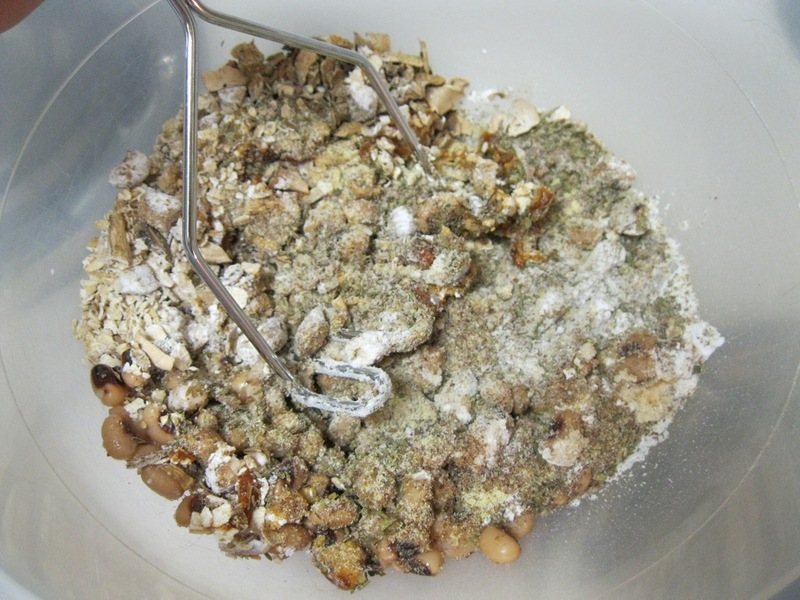 Sorry, I should have been more clear… I’m super allergic to mushrooms so I’m trying to think of something that would work both flavor and texture/moisture wise. Any suggestions? Thanks for the clarification. I’m working on 2 other burger recipes (seriously… I love them). Neither has ‘shrooms but until then, try chopped black olives or chopped artichoke hearts. Do you use cooked quinoa? For the other burger recipes? No, but I do make portobello mushrooms stuffed with quinoa that are lovely on a bun as a burger. ( ~m*) <mfw I saw these burgers.